Not long ago, I returned from a two-week trip to Israel and the Palestinian West Bank with our youngest daughter, Deborah. She had never been to this part of the world, and it was my fifth trip, so naturally, she thought I’d be the perfect person to show her around. While there, I was able to connect with the leaders of a few ministries in Israel as well as the West Bank. In Jerusalem, we stayed at the Tantur Ecumenical Institute (tantur.org) situated on the border between Bethlehem and Jerusalem. This center for interfaith studies had its genesis during a historic conversation between Pope Paul VI and the Patriarch Athenagoras of Constantinople on January 5, 1964. Subsequent sessions with Father Theodore Hesburgh of the University of Notre Dame and the pope led to groundbreaking on June 4, 1967, the day before the Six-Day War broke out. The Institute opened in 1972. Today, almost 50 years later, Tantur, administered by Notre Dame, offers a variety of continuing education courses for pastors and other clergy professionals on sabbatical. It is also a center for independent research, as well as a retreat for those wishing to go deeper in their faith journey. I highly recommend Tantur to those considering a sabbatical and who also have an interest in the Middle East and peacemaking. Anyway, there we were. I was invited to speak at one of the Tuesdays@Tantur lectureship series. My topic was “The Challenges Facing the Church Today in China.” The next day, Deborah and I walked 800 meters to the Bethlehem checkpoint. This took about 30 minutes and happened in the morning. Coming from Bethlehem to Jerusalem were Palestinians who had jobs in the city. This is their routine every day: walk or take a taxi to the checkpoint, be processed by Israeli police, pass through, get on the number 231 or 234 Arab bus and get off at Damascus gate. We went through the checkpoint, whereupon — after passing through a buffer zone — we walked beneath a section of the enormous Bethlehem wall that is 15 kilometers long, give or take. At some corners, there’s a watchtower in the wall that made us feel like we were in a prison. The wall is 8-10 meters high and has a lip or overhang that extends on the Bethlehem side. Clearly, some have tried to see the bright side. Posters and graffiti are plastered all over the wall. One section features the stenciled letters BETHLEHEMLAND, a la the HOLLYWOOD sign in Southern California. A hotel nearby calls itself “The Walled Off Hotel.” A very good likeness of President Trump adorns another section of the wall. Not far from the Walled Off Hotel, a young man warned us that the police up ahead were gassing a demonstration. His English was not great and we could not hear a disturbance. So we continued, making a couple of turns, and then passed a contingent of soldiers with automatic weapons drawn. They did not stop us, and we continued to walk until we reached our destination, Bethlehem Bible College (BBC), where we were to meet Rev. Ray Vardano and his wife, Donna. BBC is an institution that trains Palestinian Christians to be leaders and pastors. Later, we met with Dr. Bashara Awad, the founding president of the college, in his office in a beautiful new building. Some residents stay on the small campus in an older building that used to be the Helen Keller School for the Blind. As we neared the Bible college, we saw a large number of youths lingering and milling about. When we got to the college gate, Vardano appeared, red-faced and teary-eyed. “Are you all right?” he asked. Yes, of course we were all right. Then he told us that the police had just dropped two canisters of tear gas in front of the college. Unfortunately, the windows were open and those inside were affected. A Palestinian attorney working for the college then appeared carrying a white handkerchief. He was dabbing at his eyes. We had followed the protest and just missed the cloud of gas. Throughout Israel and the West Bank, checkpoints are common — routine. Once, returning to Jerusalem late at night, we were stopped three times; one of them was a moving checkpoint. In this case, the police had created a road block, and we had no option but to stop and have our papers and vehicle checked. At Hebron, I assumed I could drive our rented car to the Tomb of the Patriarchs. But, after meeting with a young man and an older woman from the United Kingdom who work with the International Solidarity Movement, we realized that we needed to park our car and walk through a checkpoint several blocks away from what Muslims call the Ibrahimi Mosque. Unlike other trips I’ve taken to Israel, this one peeled back a layer of emotion that in Israel was akin to fatalism, and on the West Bank, hopelessness and despair. The mood was much different 23 years ago when my wife and I and the boys stayed at Tantur over the Christmas holidays. As a consequence of the Oslo Accords hammered out between Yasser Arafat and Yitzhak Rabin (who was assassinated only weeks before we arrived), Israel was turning over a number of West Bank cities to the Palestinian National Authority. The transfer of Jenin and Jericho, for example, had already been completed. Bethlehem was scheduled to be turned over on December 23, after the bypass now known as Highway 60 was completed. On Christmas Eve 1995, we headed to Bethlehem on an Arab bus for Manger Square. No checkpoints then. Admittance to the square proper was possible only with a ticket which we did not have. The square is not large — thus the ticket requirement — so we were able to peer over some heads and see much of the action. The Latin patriarch had made a pilgrimage to Bethlehem and was received at Manger Square, and there were bands and school groups marching through the streets and the square itself. We got caught in an incredible rush of people. This, after all, was their Independence Day! One could easily imagine the biblical accounts which told of the multitudes pressing upon Jesus as he went from city to city. We were “carried” downstream toward the square but were able to get off to the side, and, the street being somewhat elevated, we were able from our viewpoint on the perimeter of the square to witness history unfolding. Palestinian flags were everywhere, giving the appearance of a Fourth of July celebration. A two-story banner of Arafat was draped over one building in the square opposite the police station. We ambled off in the direction of the Lutheran church, sometimes called the Christmas church because its spire looks like a Christmas tree. Once again we were caught in shoulder-to-shoulder people traffic. We made it to the church without losing children. When we walked in at about 4:15 p.m., the sanctuary was empty. We sat down near the front and read the worship bulletin carefully. The service was to be in Arabic, German and English, so we anticipated a long service. As it turned out, the Palestinian pastor gave a message, a Lutheran bishop from Jordan delivered a message and an American Lutheran pastor gave a message. Lots of messages on this important Night of Messages. Her rendition on this holy night brought tears to just about everyone in the sanctuary. This was a night in which Bethlehemites were celebrating autonomy for the first time ever. When Jesus was born, the town was occupied by the Romans; more recently by the British, Jordanians and now the Israelis. The point of this digression is that back then, joyous optimism filled the air. I am not an expert on these matters so I will not speculate as to why. But it is a sad thing as a Christian to contemplate the irony of visiting the town of the birth of the Savior — the Prince of Peace — and to realize that the children of Abraham —Jews, Christians and Muslims — cannot find a way to live in peace. The Prince of Peace did not die peacefully. The Prince of Peace did not die in his sleep. He didn’t retire to the Bethlehem Home for the Aged. He died young, and he died violently, in a region where the young still die and many die violently. But when we consider the death of Jesus, we usually consider the cross on which he died to be a sign of hope. We know, this side of the Cross, that the Cross is not the end of the story. It was and is but a checkpoint. It is a metaphorical stop on our faith journey, where we must check in and show our papers. The papers simply reveal that we are created in the image of God, which assumes citizenship in the Kingdom of God. Unfortunately, the visa stamps in our passport show that we’ve basically renounced our citizenship and now need a Sponsor — Someone really important to vouch for us. So here we are: at the Cross. 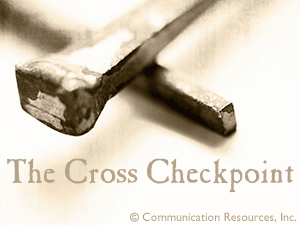 When we check in at the Cross, we check (that is, leave behind) our self-righteousness, our pride and all the good works we’ve done to impress immigration authorities. Nope, none of that counts right now. Might be important later as a citizen of the Commonwealth of God, but not now. For now, we kneel at the Cross Checkpoint, confess our sins and ask for forgiveness. This is the journey we make during Holy Week. We arrive at the Cross Checkpoint on Friday. TIMOTHY MERRILL is an ordained minister and has served churches in Oregon, Minnesota and Colorado. His doctoral work at Princeton Theological Seminary focused on the apocalyptic nature of the preaching of the First Crusade in 1096 A.D. His work has been published in the academic press including the Patristica and Byzantine Review and the Westminster Theological Journal. His book, Learning to Fall: A Guide for the Spiritually Clumsy (Chalice Press) appeared in 1998.